Hi there! Welcome to our blog, where (with a little administrative help from our humans - our "Mom" also blogs here and here) we share dog-friendly DIYs, crafts, recipes and other fun treats for dogs and those who love dogs. All pets are welcome, not just Dalmatians like us. This is a virtual playground for dogs and dog lovers of all shapes and spots! We are very social animals and love fur friends of all forms. In fact, we have a step-brother who is a cat. His name is Tiger and he's pretty cool...for a cat. We even let him have his own Pinterest board for creative cat stuff! 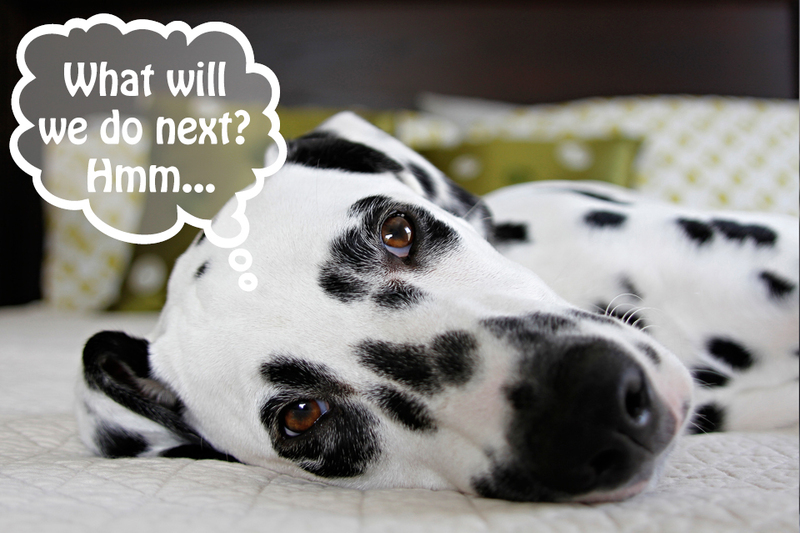 Want to work with Dalmatian DIY as a guest, special contributor, sponsor, or affiliate? Please get in touch - we'd love to hear from you. Oh my! How do you handle TWO big dogs? I get this often from strangers when they see little me with my two boisterous big walking/jogging companions, which is very often as Dalmatians benefit from plenty of exercise (read more about the breed here). It is a lot of work, but we wouldn't have it any other way after seeing the joy a "brother" has brought to our elder dogs and vice versa. I love having energetic exercise companions (aka my personal trainers). I'll use an EZY Dog Road Runner (like this one) when running which allows me to be hands-free or hands on depending on location and situation. For hand-held walkies, I recently changed to an EZY Dog Zero Shock leash (like this one). It just kind of happened that way! We aren't dog biased though - we love all shapes and sizes. Cats too! We have a fluffy old rescue cat that has been traveling the world with me for years and is still my "mane man". You make a lot of treats. Aren't you worried about making your dogs fat? It is kind of the opposite really. As we learned more about dog diets in an effort to take better care of our senior dog, we started to understand how poor some commercial treats actually are in terms of content and nutritional value (not a blanket statement - there are good ones too!) and from there we started to explore different options. They are still treats, so all things in moderation with plenty of offsetting exercise, of course! I ask myself that sometimes! In truth, its mostly because I like to share and try new things. I really truly appreciate each and every visitor to the blog, your comments, and our interactions on social media. You make it all worthwhile. Thank you ever so much! We do have advertising and affiliates, but that's more of an (someday!) offset than an actual blog income. When you shop via these links, we do receive a (VERY!) small commission, but affiliate shopping doesn't change prices at all for the buyer - it just helps you discover fun new things. You can read more about our policies/disclosure details here. Can I include your post in a round-up? Absolutely! We love making new friends and it is awesome when you invite your friends and followers to read things here on the blog. Thanks ever so much. If you'd like, feel free to use one of my photos with a link back to the original post. Please don't copy our post content, direct or paraphrased. Click here to read more about our sharing guidelines and how to Link with Love. If you would like to share more than one of my images in your post, want to use any other content, or if you have a special request, please email and I will do my best to help. I'm very flexible and PR friendly. We do not actively seek outside content, but we do occasionally accept guest posts. These are limited to interesting original content from knowledgeable sources that suit our niche content and audience. Additional information is available on our Work (or Play!) with Us page and/or via email. I did. Things are always evolving bit-by-bit around here! The template is a basic free Blogger layout that has been tweaked and customised over the years to suit my needs. Do you take your own photographs for the blog? I do indeed! :) Most images (excluding some of our guest posts and round-ups) are our own, and any photos that aren't will be credited to their source. At present, my go-to is my Canon 5D, although you may see iPhone pics/video from time to time (very convenient when out for walkies) and maybe even some GoPro footage in the future. I use Adobe Photoshop for any edits and Picasa for quick colleges. Within Photoshop, I do most of my editing manually, but I do love my Topaz tools (especially DeNoise -it's awesome!) and have a number of actions both bought and self-recorded to streamline my workflow. Only if you are using it in direct relation to sharing our content, unless you have requested and received permission for a special purpose. You can read more in our Link with Love section. If you have a special request, please send me an email. I'm very flexible and PR friendly.